Export your reminders as *.ics file. These files could be subscribed or add to most common calendar applications. With this you can see all your evernote reminders in your calendar app. I'm looking for users for testing my service. You can start as beta tester via this link: filterize.net. Using this link, you can test the service for free until end of June. I hope you enjoy the web-service. Start testing now! We are in stable status now for standard accounts (Free, Plus, and Premium). Thanks a lot to all testers! Now, we are working on business accounts. If you are interested in testing for business, let me know. Thank you very much for your effort on this. Actually, I have been working on some similar projects that I was going to be releasing into beta within the next few months. I'm looking forward to checking out your service and helping test it. Up until recently, I haven't been able to find a lot of these types of additional functionalities that would help make Evernote much more relevant to my usage needs (although it is still my favorite product that I use daily). So, again, I just wanted to thank you for this and to anyone else who has done similar work that I may have missed, I am grateful to all as well. Thanks! Hi. It sounds a nice idea, but it appears totally web-based; so presumably all filterize-related activity has to be on the browser version of Evernote which (to say the least) is not my favorite option. Not to mention that it's presumably not then available from mobile devices. I couldn't find any more technical information on Facebook or the web - can you provide some more details? @Reptevye Thanks for the nice words. I hope you will enjoy the webservice. If you have some special request for features, just tell me, maybe I can include it into filterize. @gazumped Yes the service is web-based, but you can use it with every application that puts note into evernote, so you can use the nativ desktop client, as well as your mobile application. If you login on filterize.net, it will ask you to login into the web-service from evernote to get the authentication token to access the notes. After login you can configure all features on the filterize website. Whenever you create or change a note from any device or application filterize gets a notification from evernote (a so called webhook) with the id of the changed note. Filterize checks in the background if your rules effect the note and if yes, it will process them. So after configuration you can just forget the service and it will do everything without installing any software on your machine and without using the web-version of evernote. I really like what you are doing, especially with tag hierarchies. While I'm not interested in participating in the Beta, I will be very interested in the product/service when you have a solid production release. Do you have an email list I can subscribe to? I setup a mailinglist, so you can subscribe for the newsletter and you will be informed if the service goes to productive. But the current version should be quite stable. I use it in my productive account without problem. I don't know if it's fair to call it a "bug", but all my notebook and tag names are cut off at a "emoji" character. If my notebook name is: "1. ? Google", filterize only shows "1." From my point of view this should be called a bug and I found and fixed the reason. The standard MySQL encoding (utf8) does not allow 4 byte characters. I changed it to utf8mb4 and now it works. I also refreshed your notebooks and tags, so you should see the right things now. Thanks for finding this issue. I can't find a logging on filterize.net. Yes, currently there is no logging. But it is a really good idea. I will focus on implement some logging information for the users. I created an issue in the bug tracker, so you can follow the implementation status. How many details do you want to see in the log? Just an information what filter applies, or also why each filter not applies for every note? Normally I would not store note titles for every user on the server. Would it be ok, if I only provides links to the notes, so you have to check the note in your evernote app? How many details do you want to see in the log? It would resolve my concern about run-away automation, or even my error in setting a rule. If it's batch note processing - At minimum, show the title and the rule; a link to the note would be a bonus. I implemented a filter log history. There are no links yet, but the main information is displayed. Now there are also links to the note and the filter in the activity history. This sounds very good. Could you please show us an example? Your link above just goes to your home page. BTW, I'm ready to start using as soon as you are comfortable with moving it from a Beta to a Production release. Yes you are right. If you are not logged in, you will be forwarded to the main page. BTW: There are in-app and browser links for the note titles and direct links to review a filter on the filter name. On Tuesday and Thursday, two of you have changed a lot of note at the same time, so my app was fall into evernote api rate limit. I improved the error handling. If you are interested on restart the filter jobs, you could change all these notes again or you can tell me your username (displayed in the menu bar at the right on filterize.net) so I can restart your jobs by hand. Could you please explain how the "evernote api rate limit" works, or maybe point us to a reference? 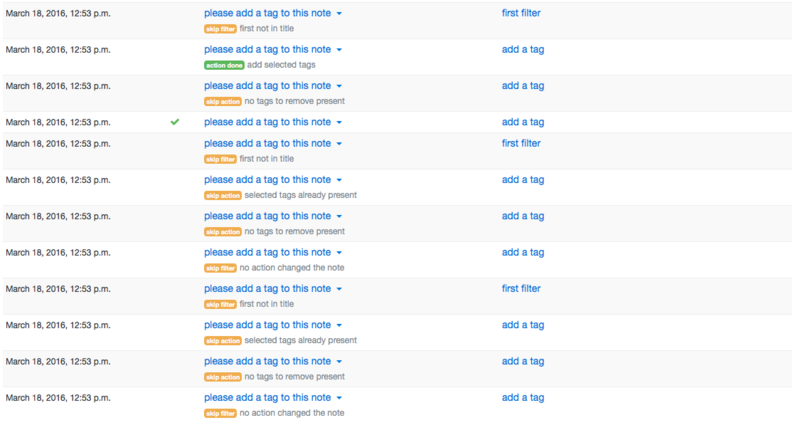 So, does this mean that if I put in a Rule that changes a lot of Notes, then the processing may fail? Is there any way you can test for that, and issue the changes in batches so that it doesn't fail? There is a detailed description in the evernote reference. The main idea is, that third-party apps are allowed to do a limited number of request per time unit (normally one hour). This is a per user limit, so if one user reaches that limit for an app other users are not effected. This means, that if there are a lot of change within a short time, only the first success, while the others fail. This happen this week for two users, because they want to change about 500 notes within some minutes. It is possible to detect this rate limitation, what is implemented now. If the app runs into rate limit, all pending changes will be queued and processed as soon as the rate limitation is gone. So in the future, if you want to do a lot of changes, some of them will happen immediately and if rate limit is active the others will be processed later. It is always very encouraging to see so many users building third party applications and trying to extend the functionality of the Evernote service. I looked up your service and see that it has immense potential. However, having worked and tested ( even beta test) several applications over the years, i have both generic and specific to your application. 1. Long Term Monetization : The most important aspect of course is the long term sustenance, both in terms of monetary involvement and in terms of interest of sustained development. Many apps that start off very well, start waning off slowly, over a period of time. This could be due to the lack of planning their application as a business model, and while the product itself may be going good, - Springpad or Blogsy for eg. Or even in some cases, developers just lose interest and don't even bother to update their app or even respond to customers. ( An IOS Notetaking app that called itself an Evernote alternative, for which i paid 5 $ some 3 years ago ( at a time whn the Stock IOS Evernote client was way too buggy. The app subsequently did not make any more updates, and does not have a direct Reminders integration. No response to mails. 2. Security : Evernote contains my most precious data, and millions of users are extremely skeptical of handing over their data to Third parties unless they have built apps across the client, and the comunication happens between the clients and the Evernote servers. However, in your case, it seems to be a Web based application. I am very much skeptical here. 3. Speed of Internet : Another reason why we need native client support and offline support is many of us live in places where Internet infra is either too poor or too icostly. Even IFFTT which relies on Web based interlinking has native apps. If I am on the move, your app becomes difficult to use. Building native apps takes care of Problems 2 and 3. 4. Singular subcription or One Time Payment : This is the trickiest part. I have a recurring subscription to Evernote Premium. It provides me value, since i use this service multiple times a day, across many Devices. It provides me value for managing so many aspects of my life. People who only use it to manage a simple checklist, could pick a free service off the web. Evernote Premium gives them no value. An App like IAnnotate for eg, could offer me value at 10$ as my stock Pdf annotator. This is because i use it as my default Annotating app, but I dont use it everyday. So, if IAnnotate offered a cloud service and asked me to subscribe, would I? No. This is the question that i face when i see your app. Your app has great potential for power users, almost like a need for an app that compares Conflict Change Notes, an idea that has been proposed several times in the forum. The filtering process of your app is extremely useful, since i need to automate, a lot of notes, and re-work Tags around them, and your app is offering this scope. But how long would i use it? I would set up my filters, once or twice. Maybe, come back once a month or later. But would i come back to your app everyday, for filtering needs or calendar exporting ? In my opinion, no. Although, the price of the recurring subscription is possibly affordable, your app to me doesnt figure the scope to be priced as a recurring subscription. You might possibly even want to set up a poll, to figure out your questions around the product. You need to work out these important questions in the long term interests of both yourself and the users who come to rely on your products. Its great to build a product, but without long term thinking of sustenance, then its pointless in the long run. Good Luck. Thank you @Panzerkampfwagen for this meaningful questions. I will work on them and give response in this thread and on the filterize website. I thought about the questions @Panzerkampfwagen asked. And I have some answers and some points to discuss. Do not store/process any user content --> No service will be available or at least every information has to be fetched from evernote every time the user interacts, which is against the evernote api usage guidelines. Also at least the access token has to be stored. As you mentioned, with a local client and not an implementation as webservice it would be possible to use firewalls so the user can be sure, that there is only communication between the user and evernote, and hopefully the access token is not leaked. The drawback of such a solution would be, that the user have to run a native app on its computer to process all node changes. Yes IFTTT provides native apps for different platforms, which has started some years after the service itself started. The main idea on the webserive is, that (similar to IFTTT) you configure your filters online and they work in the background so you don't have to think about them. If there is enough interest on the service I will whink about create also native apps, so user can change there setup offline and sync it to the server if the connection is available again. The other kind of native app would be, putting the full service into a native app. But then the user has to setup a server for his own or at least needs an application running that will do the filter process locally. To build a webservice doing this was a design decision I made. But if there is much more interest in such a local version, I will create such an application, too. Native app vs webservice: From my point of view, a webservice gives you continuous service. So if its offers a one time payment you should get a lifetime service. Otherwise users upset if the service goes down. Also the service provider has continuous costs, which could be a problem if all interested user use the service, then the service provider has no cash flow. On the other side, with a regular payment the user agrees e.g. for paying one year, while the provider agrees to run the service for one year. If at any point of time the provider shuts down the service (after all paying periods) the user loses no money. So I decide for a regular payment. If I would offer a full native client, which does all the processing locally, I would also offer the one time payment. day-to-day value vs. sporadic use of the website: The question here is, where is the main value of the service. I see the website itself (or a future native app for configuration) as a required tool, but not as the main value. In my point of view the value is in the background. The service will run continuous in the background. Whenever you create a note, which will trigger a filter, this filter will process the note. So if you create notes on a daily base you get value on a daily base. I think this is similar to IFTTT. You will not use the app or the website everyday to create a new receipt, but it will proceess events on any webserive on any time, so it will provide value on a day-to-day base. This is another reason, why I offer the service with a subscription model. One time users vs. regular users: If somebody just want to organize there account on a one time base, he can purchase the cheap 1 month paket. With this he can create a lot of filters and run them on the current notes, and after this month he either finished his work, or he will continue use for new note. In this case he can start a subscription. So there is a one time option for one time usage. I hope these answers would give insight to some of my thought. I'm looking forward for further discussions on these points. BTW. is there a possibility to add a poll inside of a thread in this forum? Or do I have to start a new one? Thanks for the detailed answers and discussion. It certainly adds to my confidence that you are providing a viable service, and intend to continue it for the long haul. If you have not do so already, this looks like good stuff to publish on your web site. The only "poll" I know about is the up/down voting on a topic/idea. You already have this thread, so people could vote on it. I just did. @Pascal Held Thank you for the response, this forum has a lot of interested people who although technically dont know anything still look forward to encouraging the deveelopers. Very Good. Regarding the IFTTT, it was just an example which i cited. I stopped using it, because some of the auto triggers ruin the formatting, messing up EN notes, which for me are scared. I dont know if they have fixed it yet. 1. Security worries and communication only between client + Evernote? 2. Secondly, if i set up a trigger, and i want the system to work automaticallly, is it possible to implement without the secure system point 1? 3. My understanding is that the trigger will sto working, the moment the user does not renew the web service. Pls correct me if i am wrong. If the standalone app is implemented, then also, the recurring payment model is happening ? ( Because now,the developer dont have web service maintenanc ecosts). When my head is little fresh, more questions will come.. I will fire then. Good luck with the project..
Also, it is a shame no Poll is in the forum. Please use Google Docs and add a link. Good luck Bro..
this forum has a lot of interested people who although technically dont know anything still look forward to encouraging the deveelopers. Very Good. Thank God we have experts like you to keep us technically-challenged folks from doing stupid things. BTW, can you tell me where to get a crystal ball like yours that reveals the technology that other people know? Developing apps and add-ons is a very, very technically challenging task. Making them marketable and into a viable business is even harder. I do encourage all inspired entrepreneurs and developers to go a far as you can. Of course, it is incumbent on us consumers to do our due diligence before we use/buy your product(s). That's why I rarely use beta products, and have indicated to @Pascal Held that I am very interested in his product, and will give serious consideration to buying/using it when he has the confidence to release a production version. Even then, I will likely test on my Evernote test account before I use on my main Evernote account. Sorry Michael, The spell checker problem i think happened due to the slow speed of my internet service. Maybe, that's the reason why you may see in my posts on the forum, insisting developers to build native apps that work without an internet connection. I don't understand what you meant here, sorry. Or were you referring this to @pascal held ? I think you got offended, if that is true, I am sorry. I was basically referring to people like me who don't have technical knowledge, but are only eager to support the developers by providing them feedback. I am sorry, if i made a wrong comment, which i never intended to do at all. Evernote can notify webservices, but not local applications. That means that changes are not processed immediately. But you can sync every 15 minutes, so changes will be processed after this 15 minutes. You have to run the application all the time, because the processing can only be done if the app is running. What do you mean with automatically? If you provide a machine which runs all the time, and you trust this machine that nobody else can access it (e.g. hackers via internet) then yes, it is possible. The developer has all kind of costs, especially the current costs require a continuous cash flow. So If you want to run the filters for 20 years, I have to provide the server for 20 years. regular payment: Requires subscriptions and services that stop working if somebody does not pay. finance the service by ads: That is hard for this kind of service. Ads could be places on the website itself, which is not used frequently if the filters are set up. Another idea would be let the webservice put ads into your evernote account, but I think user would kill me, if I add ads to there notes are create extra ad notes. What happens if the developer miscalculated the prices? Thank you. All questions are welcome. Of course, it is incumbent on us consumers to do our due diligence before we use/buy your product(s). Yes you are totally right. The user have to trust in the software as it could have bugs (which could damage the users content). That's why I'm looking for courageous beta testers ;-) (BTW: I use and test it with my live account). Also evernote recommends to start testing new addons with a test account. Filterize is a great idea! I have a few applescripts acting on evernote items that I run daily, and I would love to run them through the web. To what extent will it be possible to customize actions? For example, one of my scripts is modeled after Gmail Snooze (https://gmailsnooze.wordpress.com/): I tag notes with (for example) "followup10days" and one of my scripts daily changes that tag to "followup9days" ... "followup8days" etc until it gets to "followup0days" and it moves the corresponding note to my Inbox folder. In my workflow this is much faster than Evernote reminders, but if my computer is shut down everything is delayed, so it'd be great to run it on the web (exactly like Gmail Snooze). Do you have a sense as to whether such a script could be implemented with Filterize? Great news, filterize is official in productive status now. Thanks to all of the testers. We found and fixed a couple of bugs. Also some new feature like complete logical expressions for the conditions are possible now. Next, we will focus on business accounts. At the moment only standard "Free", "Plus", and "Premium" accounts are handled. If you are interested in being a beta tester for your business account, please contact me. You can configure most of the available actions, e.g. specify your tag or something like this. At the moment filterize is complete event driven on note create or update events. So there is nothing like a "cron job" yet, to processes your notes every night. But such a feature is on the feature request list, and will be available at some time. I think you can setup such a process with reminder times (the final followup date), which can be set by filterize, and a saved search for "reminder tomorrow" for example.